When I traveled the world as a young adult, I didn't care where I slept. It could be a hostel, the floor of a friend's bedroom, or a couch. Now that I'm a 30-year-old with three little kids, I'm much more aware of our accommodations when we travel. We need somewhere quiet, with a spot for the baby to sleep peacefully where the 2- and 5-year-old won't wake him up. It also has to be kid-friendly and a great location. 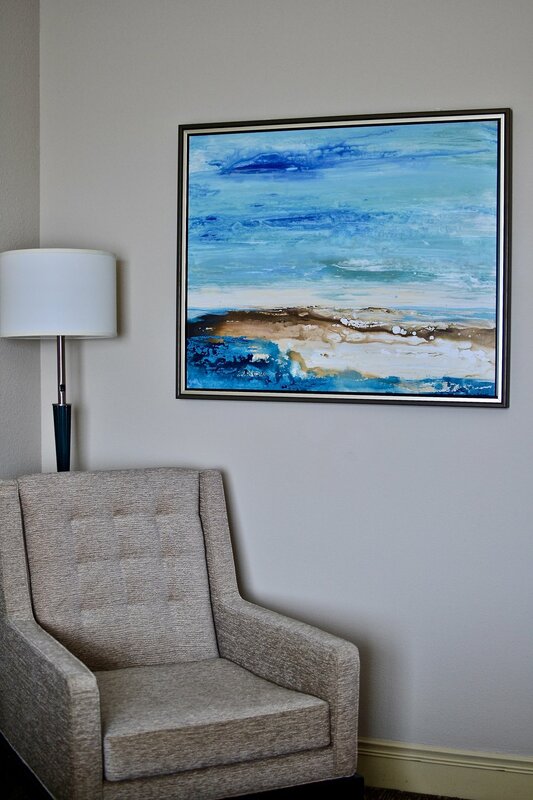 On our recent trip to Tampa Bay, the Hilton St. Petersburg Carillon Park was the perfect choice for serenity and calm after a crazy day of travel and exploration. The Hilton St. Petersburg Carillon Park, as you can guess by the name of the hotel, is located in St. Petersburg, FL, which is just outside Tampa Bay. I actually found this location to be ideal for our family. Although we had to drive about 20 minutes to go sightseeing in Tampa, we were also an easy drive from Clearwater and St. Petersburg which boast some of the best and most kid-friendly beaches in the world along with fun sights and activities of their own! Another perk of staying outside of Tampa was the peace and quiet. 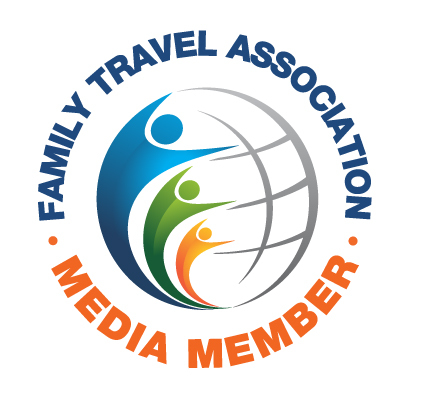 If you're reading this you have probably traveled with young kids before. Little ones tend to get "out of their routine" while traveling, which is a nice way of saying they ask you for 10,000 snacks in the span of an hour and don't take their much-needed naps. This means that parent and child alike are exhausted at the end of the day, and you risk poor sleep from over-tired kids. Thankfully, the Hilton St. Petersburg Carillon Park is away from the noise and bustle of a big city like Tampa, and it felt like we were returning to a haven each time we pulled into the Hilton parking lot. We could breathe a sigh of relief and it seemed like the entire family immediately felt more relaxed. 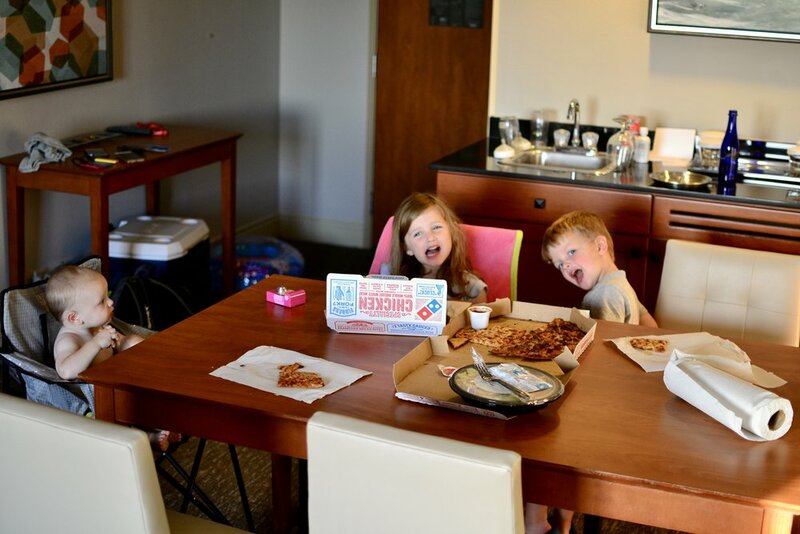 We are a family of 5, and we stayed in the Junior Suite with an adjoining guest room which was absolutely perfect for us. The big kids enjoyed their double beds and their *very own tv* in the adjoining guest room, while the baby slept perfectly in a crib provided by Hilton in our spacious bedroom (with a little help from the white noise machine we travel with). The Junior Suite is perfect for families because there are a parlor and kitchenette separate from the bedroom. We could put the baby down for a nap, then set up snacks or a meal at the table for the big kids. I also loved that there was a desk so I could upload my pictures from the day to my laptop and take notes for the article I was writing while the kids slept. (Plus free WiFi! A must for this work-from-anywhere mom). We also prefer to buy groceries and prepare our own meals and snacks when we travel to save money and eat healthily, so having the kitchenette to make sandwiches or blend my shakes was a lifesaver! The Junior Suite with a King bed was one of the best parts of our stay. The bedroom itself was roomy and comfortable. We slept better than we do at home in the Hilton Serenity Bed - I was in love with the thick, comfy duvet! Our room also included a vanity and sink area separate from the bathroom, which housed both a shower and a whirlpool. The kids had more of a standard setup with two double beds and an attached bathroom. I was worried we would be in and out of their room during the night, but they also slept like logs in those cozy beds. We were reluctant to go home because we felt so well-rested by the end of our stay! As I mentioned above, I noticed the workstation right when I walked in. The desk had plenty of room to spread out, and I was probably a little too excited about the desk-level outlets. There are outlets on each lamp, so you can conveniently charge your phone, laptop, or tablet without having to hunt behind tables and couches. Each bathroom came with complimentary Crabtree & Evelyn toiletries. We usually pack our own, but inevitably forget something in the chaos of packing. It was nice to have high-quality substitutes for our usual soap or shampoo while we stayed at the Hilton. Finally, the kitchen came with a coffee maker and caddy, a mini refrigerator, a sink, and a dining table, plus some storage space in the cabinets underneath the sink and coffee maker. We could keep our room nice and neat by storing our groceries out of sight. Of course, the first thing my kids wanted to check out was the pool. The pool area was gorgeous, surrounded by palm trees and lounge chairs for relaxing. We found the water to be nice and warm, even when swimming during the evening hours. There's also a hot tub overlooking the walking trails behind the hotel. Speaking of the walking trails, our family loved the hiking trail and jogging track surrounding the small lake behind the hotel. We spotted tons of birds and even a few turtles on our walk and loved the convenience of a safe, quiet place to take the kids to expend their energy. There are several outdoor dining and lounging areas that use the same peaceful blue color palate the rooms are decorated in. It would be a serene little spot for afternoon drinks on the patio or coffee in the morning. Don't forget about the fitness center! We didn't utilize the workout space during our stay, but it's nice to have the option if you're committed to your workout routine. Finally, the staff was incredibly kind and welcoming. Each time we entered or left the property they greeted us personally, chatting with the kids and asking them what kinds of things we had gotten to do on our trip. They were also ever-so-gracious and patient when our 2-year-old locked us out of the adjoining room late at night. 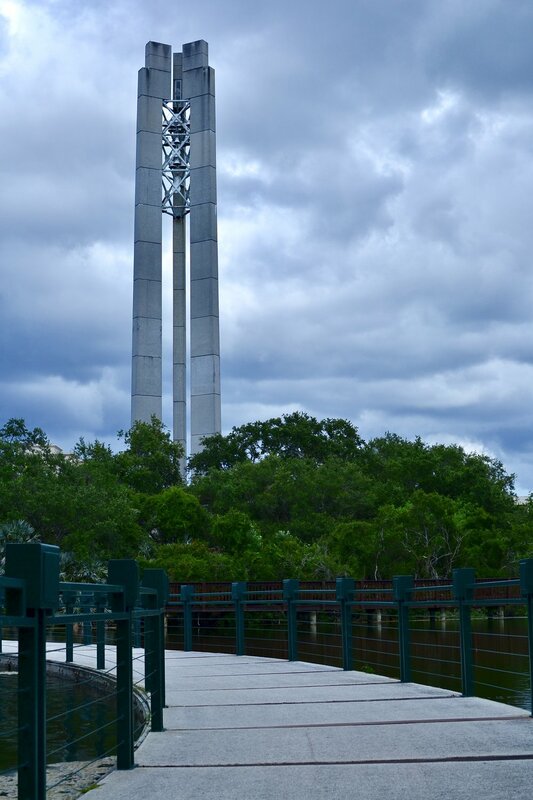 We are incredibly grateful to the wonderful people working at the Hilton St. Petersburg Carillon Park. They made our stay so memorable! 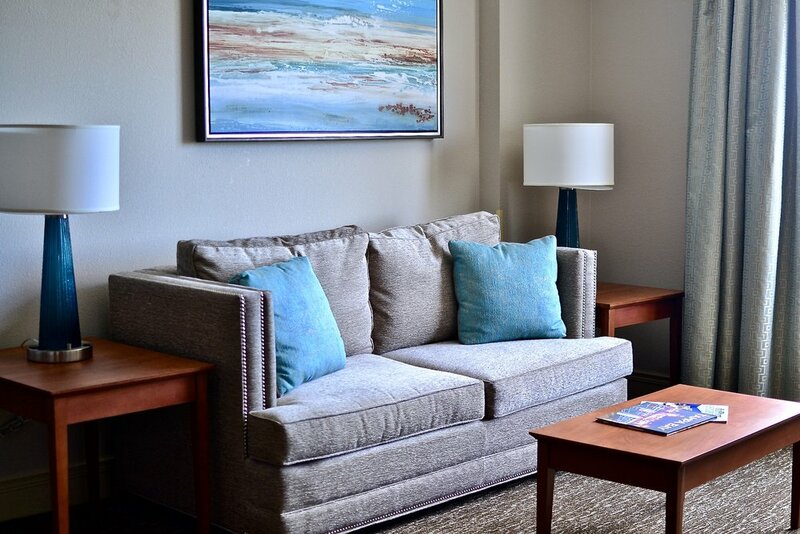 During the months of July through September, Florida residents can save money by booking directly through the Hilton website. Check out the deals in the Tampa / St. Petersburg / Clearwater area HERE! Also running this July through September is the Best of Tampa Bay, a program which gives you discounts on ZooTampa, Tampa Bay Food Tours, Pirate Water Taxi, William Dean Chocolates, Yacht StarShip Dinner Cruises, golf, and more when you book through HIlton. Check out the program details here.